The Cat Kit is a monthly subscription box that contains items for both you and your cat! The Products: Unique and well-designed items for cats and the people who love cats, curated according to a monthly theme. Check out all of our The Cat Kit reviews and lots of other great boxes for cats and cat lovers in the Pet Subscription Box Directory! There was a standard information card in the box listing the items. This is quite small, but I am not complaining. My cats tend to prefer smaller catnip toys. And we have several other Housecat Club toys from various cat subscription boxes – they are pretty durable. This isn’t available in The Cat Kit’s shop so I took the value from the information card. But while I was in the shop, I saw this purse which is awesome. Anyway, I wonder if I can wear this along with the hair pins from Cat Lady Box? Cats everywhere! This is cute and tasteful, thanks to the smaller size. I am going to proudly wear it on a jacket or cardigan this spring! And here is the part where I complain about how difficult it is to take photographs of black cats. At least you can kind of see Madison’s eyes here! Monkey investigates the toys from the box. Isn’t he beautiful? Sneaky was a little annoyed with me; I’d tried to photograph items from three separate cat subscription boxes in one day. I like the look on her face in the second photo. Mr. Kitty has not been having the greatest week. He is shedding his corneal sequestrum and it is bothering him a bit (the veterinary ophthalmologist warned me this would happen). But, although his eyes aren’t looking good, he seems to be feeling all right otherwise. And he was interested enough to sniff the toys! If you have been reading some of my other reviews, you will know that I recently adopted a new cat. He is about 9 months old and I don’t have a name for him yet. But here he is. He doesn’t quite get photo sessions yet, but he will learn! Verdict: I calculated a value of about $45.48 for the January 2017 The Cat Kit, or a little more if you go with the MSRP for the book instead of the Amazon price. 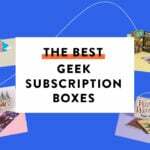 That is above the cost of the subscription for sure, which is great for a box that contains so many items from small producers and a book (since books are so often discounted). I thought everything was a wonderful fit for the New York theme, but also I just liked the items in general! What do you think of January’s The Cat Kit? Do you subscribe to any cat boxes? How do subscribers rate The Cat Kit? Do you subscribe to The Cat Kit? Add your rating now! What a great box. It is rare when I like everything in a box. Congratulations on the new addition. He is adorable. Cats have a way of naming themselves sometimes. Bodega cats are everywhere in NYC. I’m so jealous you got a copy of the book, I’ve been wanting to order but it was out of stock every time I looked. And your new baby is so cute! Yay new kitty! Congrats! The Cats of New York book looks awesome. There are some really funny comics online about these cats, they help to keep rats and bugs out of bodegas. Not exactly legal, but most people don’t complain since it keeps them clean. anyone know how much shipping is if you order from The Cat Kit? That purse is seriously calling my name! Awe! Your new baby is absolutely adorable! I have two cats and 4 dogs and would totally adopt more cats if my husband would tolerate since he handles all the yuck. Lol! How does he get along with the other cats? I know what it’s like to care for a special needs pet. One of our dogs is a 14 year old Boxer/Staffishire Terrier mix. She gets all kinds of vitamins and pills for this and that, special food because she can’t quite chew dry food and boy is she picky! Haha! Your new baby is very cute! I love the little bit of black on his nose. I follow the Shop Cats photographer on IG, his pics are amazing! I need to get that book! Sneaky’s expression in that first picture cracks me up. Thanks for another great review and set of cat photos, Ragan! Welcome to the new kitteh!! "Instead of the blush it's the same time of book in highlightery bronzers. Saw it on tartes website"